Are the people of Seoul worried about the nuclear threat from North Korea? Going on a press trip to Seoul just days after North Korean autocrat Kim Jong-Un threatened to carry out nuclear attacks on South Korea, Japan and the US wasn’t exactly ideal timing. But after bombarding the poor PR company in charge of the trip with a barrage of questions, placating worried parents and notifying the Foreign and Commonwealth Office of my travel plans, I flew out to Gangnam with a group of UK tech journalists. While spending much of our time checking out LG’s latest innovations and being shown the sights of Seoul, it was hard to ignore the heightened tensions with the neighbour state. The annual military exercises that take place between the US and South Korean forces around this time always tend to raise tensions, with North Korea viewing the training drills as a practice run for invasion. However, this year the verbal response from the north of the peninsula has stepped up a gear, with a “state of war” being declared. It was feared that North Korea may take the 101st birthday of the founding father Kim Il Sung as an opportunity for its threatened missile launch or perhaps something more sinister. However, the anniversary came and went without incident, except for some isolated protests in Seoul where South Korean activists burnt effigies of the Kim family in the streets. With Seoul only an hour or two’s drive away from the border, are the inhabitants of the densely populated metropolis worried about an imminent nuclear missile strike from their neighbours? Not a bit, it would seem. Obviously it would be unwise for the South Korean government to ignore the rhetoric from Pyongyang, with defence minister Kim Kwan-Jin stating that Seoul is fully prepared for an attack. However, while the authorities are acting with due caution, the general population of Seoul appears to be paying the young despot’s threats very little heed indeed. It would probably be fair to say that the news of YouTube sensation Psy’s follow-up single to Gangnam Style has generated more buzz here than the bellicose threats from the fledgling dictator. You can hear the Korean rapper’s work being played constantly in bars and shops across the city and we were also treated to his new video several times by our hosts. There are even Gangnam Style socks for sale in the tourist-trap souvenir shops (yes, reader, I bought them). Questions about the current tensions on the peninsula are generally met by the locals with a friendly chuckle and a reassurance that we’ll be perfectly safe. 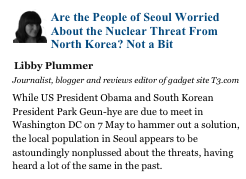 While US President Obama and South Korean President Park Geun-hye are due to meet in Washington DC on 7 May to hammer out a solution, the local population in Seoul appears to be astoundingly nonplussed about the threats, having heard a lot of the same in the past. On the streets of Seoul, no one is talking about war or looking for bomb shelters. Armageddon, Koreans believe, is not at hand. The mood is all for peace and dialogue. The question remains where, how, on what terms and to what end. Kirk hits the nail on the head. The city is as busy as you’d expect a bustling conurbation to be. In fact, many of the streets are currently lined with strings of colourful lanterns to celebrate the 2,576th birthday of Buddha on 17 May while the blooming cherry blossom trees add an extra dash of defiant cheerfulness. Tourist hotspots, such as Gyeongbokgung Palace are still very busy, although, most of the tourists there appear to be Korean and Chinese, with very few Westerners around. We were told that foreign visitor numbers are down since last year, most likely as a result of the ongoing tensions. City nightlife still appears to be in full swing, although US soldiers stationed in South Korea are currently on curfew, cutting the number of Westerners out on the streets late at night. There is no visible military presence in central Seoul at all, although we did spot a lone army helicopter hovering above the city. It wasn’t until we ventured to Paju, just 16km from the border that we spotted soldiers at a South Korean army base. Most of the tiny guard huts running along the length of the border appeared to be empty – we only spotted one that was manned. Our tour guide compared the country’s current situation to that in Germany before the fall of the Berlin Wall – in the sense of a country temporarily divided. Rather than concentrating on the current tensions and expecting another Korean war, there is much talk of inevitable reunification in the not-too-distant future. In the meantime, the good folk of Seoul carry on with their daily lives. Maybe if Kim Jong-Un uploaded a record-breaking YouTube video with a memorable dance routine, they’d take more notice of his increasingly desperate attempts to cement his place in history. This article was originally published on 22 April 2013 on The Huffington Post UK. Stricter gun laws for the US? Another day, another school shooting. Suspected gunman Adam Lanza, is said to have shot dead 18 children and six adults at Sandy Hook Elementary school in Newtown, Connecticut, as well as his mother and then, somewhat predictably, himself. It’s the third large-scale shooting in the US in 2012 – twelve people were killed in a cinema in Aurora, Colorado in July 2012 and six people were gunned down at a Sikh temple in Wisconsin in August. The list of major gun attacks in the US, including the Virginia Tech massacre in 2007 when 32 people were shot dead, is disturbingly long. Every time one of these tragedies happens, the US Government and media are outraged, mournful, and extremely vocal about introducing legislation to stop it from happening again, but nothing ever happens. The second that there’s any mention of a sensible crackdown on ownership and regulation of weapons, the gun evangelists point everyone towards their precious Second Amendment, which is clearly more important to them than slaughtered children. “A well regulated Militia, being necessary to the security of a free State, the right of the people to keep and bear Arms, shall not be infringed”. Adopted in 1791, just a few years after the American War of Independence, the amendment was of its time – written to ensure that the American people could defend themselves against the British and any other enemies. It wasn’t intended to enable a disgruntled, mentally unstable individual to legally buy guns with ease and kill with alacrity during times of peace. Times change, and so too has the context of the original Amendment. Let’s not forget that the Bill of Rights itself originally only applied to white men, with women, native Americans and African Americans left out of the party until Amendments further down the line. I’m British and I live in the UK, so why do I even have an opinion on American gun control? Well, I have family on the other side of the pond and my brother is a naturalised American. I’d like to think that they live in a country where any murderous oaf can’t just waltz into a Walmart and stock up on guns and ammunition. Sadly, that’s not the case. On one visit to the US, we did a National Rifle Association of America shooting course, so I have a qualification from the NRA stating that I know how to load and fire a semi-automatic handgun. Preposterous, I know, but true. As the only Brits in the room, we were also the only ones who’d never fired a gun before. I was amazed that we were just able to walk in and handle a gun – no police record check or anything. To be fair, the trainers were excellent, with a refreshingly responsible attitude to guns. As well as mocking their own organisation’s quaint insistence on referring to guns euphemistically as “firearms”, rather than “weapons”, our instructor also told us that if any of us were thinking of getting a gun for home protection then that would be a extremely foolish. “Get a Louisville Slugger instead”, he said (that’s a baseball bat, to the Brits). Making this training course mandatory for gun owners would certainly be a step in the right direction. Anyway, what the hell do we know about gun massacres in the UK? Unfortunatley, a fair bit. In 1987, when Michael Ryan used several legally owned guns to kill 16 people (including his mother) and injure a further 15 bystanders in the notorious Hungerford Massacre, the Government immediately took steps to change the law. As a result, the Firearms Amendment Act 1988 banned ownership of semi-automatic rifles and restricted the use of shotguns with a capacity of more than three rounds. In 1996, when gunman Thomas Hamilton went into a school in Dunblane, Scotland and shot dead 16 pupils and a teacher, the nation was outraged. Which is precisely why there was only minimal opposition when the Government took steps to implement the Firearms Amendment Act 1997, effectively banning private ownership of handguns in the UK. As a result, we have a very low number of gun-related deaths on UK soil compared to the USA. Speaking in the aftermath of the Sandy Hook shooting, President Obama said: “Our hearts are broken” and added “We’re going to have to come together and take meaningful action to prevent more tragedies like this, regardless of the politics”. A strong statement, and no doubt that a visibly upset Obama was expressing genuine sentiment, but as a political statement of intent, they’re just words. I don’t wish to seem opportunistic, but this latest tragedy provides an ideal chance for the debate on gun control to move forward. However, as things stand, it’s highly unlikely that any significant changes to gun ownership laws will make it through Congress. “Today is not the day to engage in a policy debate about gun control”, said White House press secretary Jay Carney on the events at Sandy Hook. To which I say, yes it bloody well is. This article was originally published on 15 December 2012 on The Huffington Post UK. I found out that Christopher Hitchens had passed away during my usual breakfast time sweep of the news feeds on Twitter, and my first (perhaps, rather selfish) thought was how sad I was that I’d no longer be able to read his regular contributions to Vanity Fair and Slate. His own sibling, journalist Peter Hitchens described, in a heart-breaking piece, how he’d heard about his brother’s death on a morning radio bulletin. The famous author, journalist and polemicist finally succumbed to oesophageal cancer after being diagnosed in 2010 during a book tour to promote his autobiography, Hitch-22. It wasn’t just his razor-sharp wit, his compelling and accessible writing style and his gift for oratory that set him apart from most modern-day scribes, it was his unflinching passion for tackling the most sensitive and complicated of subjects, with no target too sacred. 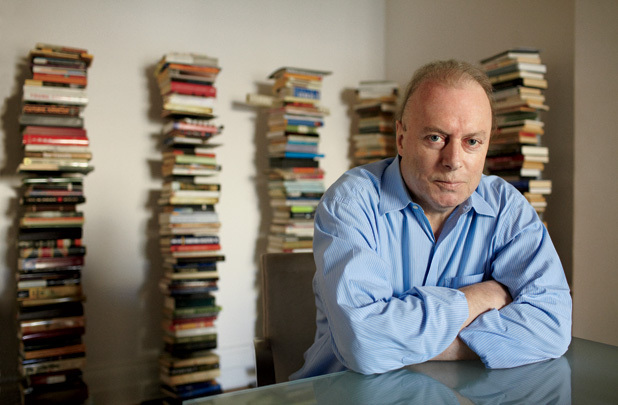 Most writers wouldn’t dream of partaking in the kind of heresy that Hitchens displayed in his scathing attack on Mother Teresa, claiming that she opposed measures to end poverty, such as the provision of contraception, preferring to instead to encourage the poor to accept their poverty. Hitchens (or Hitch) also penned The Trial of Henry Kissinger in which he argued that the National Security Advisor and later Secretary of State to Presidents Nixon and Ford should be prosecuted for war crimes. Not one to rest on his laurels, Hitchens constantly pushed the boundaries, even agreeing to be waterboarded for a piece in Vanity Fair. Impossibly well read on a vast variety of subjects, Hitchens was something of a polymath, not unlike one of his heroes, Founding Father Thomas Jefferson. Hitchens was also an admirer of English radical Thomas Paine who, as the author of revolutionary pamphlet Common Sense, was a heavy influence on Jefferson, playing a key role in shaping the political landscape that surrounded the drafting of the Declaration of Independence. 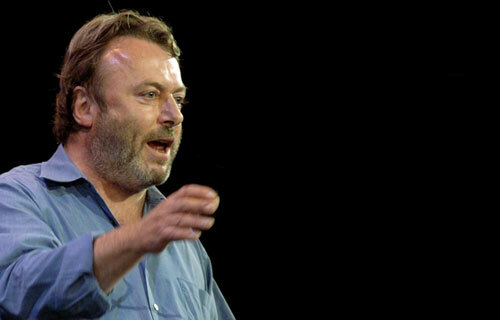 Forming part of the so-called ‘Four Horsemen of New Atheism’ alongside non-believers Richard Dawkins, Dan Dennett, and Sam Harris, Hitchens was an outspoken critic of religion. While Jefferson sought merely (but wisely) to keep the state and the church separate, Hitchens was more interested in abolishing organised religion altogether, earning him just as many critics as supporters. Famously, Hitchens was also a huge admirer of George Orwell, something which he put on record in his book-length essay on the subject named Why Orwell Matters (published as Orwell’s Victory in the UK). 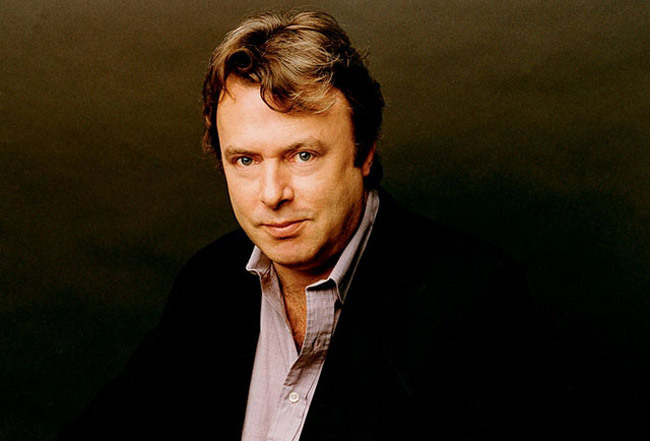 Some of Hitchens’ views may have been somewhat questionable, none more so than his support for the invasion of Iraq, but it was impossible not to respect the extraordinary skill and eloquence with which he argued his point. 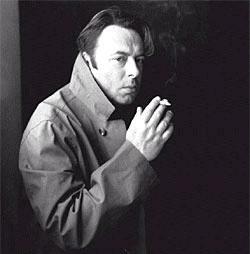 If more journalists possessed even a tenth of Hitchens’ impressive vocabulary and command of the English language, as well as his tenacious skepticism in the face of accepted opinion – not to mention his ability to meet deadlines with near-perfect prose after a night on the booze – the Fourth Estate would be far better for it. The world’s greatest thinkers and writers have almost always been contrarians, heretics and, in some cases, outlaws (in the nonconformist sense, not the gunslinger sense). The writers that really make a difference to society are the ones who make us question, and that’s why Hitchens matters.